Oklahoma bass fishing offers a unique angling opportunity. The reason is because in the right season you could catch three different species of bass in one day at some of these lakes! You will see, when looking at a map of Oklahoma, the eastern part of the state has many lakes. Lake Eufaula is a huge 102,000 acre reservoir impounded in 1964. There are two state parks around the lake to offer facilities to visitors. They are Lake Eufaula State Park and Arrowhead State Park. Grand Lake is more popular but less than half the size of Eufaula. Grand Lake has five state parks located along its shores. They are Twin Bridges State Park, Bernice, Honey Creek, Disney/Little Blue and Cherokee State Park. Lake broken Bow is in a class all its own when it comes to scenery and trophy bass potential. Lake Broken Bow holds the state record for largemouth bass!. Fish the river channels in deep water to catch the really big largemouth bass, some may be over 14 lbs. 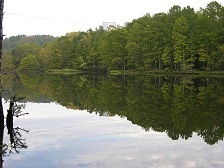 Beavers Bend State Park, located below the dam, provides cabins and other facilities. Lake Texoma is the second largest lake in Oklahoma, covering 89,000 acres. It is famous for great fishing, excellent marinas and natural beauty. Lake Texoma sits on the Texas/Oklahoma border just 75 miles north of Dallas. Lake Texoma State Park is nearby, located on the Red River. These beautiful Oklahoma lakes offer fun and inexpensive fishing trips for the family or just you and a fishing buddy. Make your reservation now at one of the state parks to start your adventure.